Iranian security forces arrested prominent human rights lawyer Nasrin Sotoudeh at her home on 13 June. She was taken to Tehran’s notorious Evin prison. Sotoudeh’s husband, Reza Khandan, has confirmed her arrest in a Facebook post. Sotoudeh is known for representing political prisoners in Iran; she was arrested in the aftermath of the 2009 presidential election protests for representing dissidents. In 2010 she was sentenced to 11 years in prison. She was disbarred and the Islamic Republic judiciary suspended her work license for 20 years. The appeals court reduced her sentence to six years of imprisonment and 10 years of license suspension. Sotoudeh’s work has been marked by her integrity fighting for those dissidents who cannot find legal representation and the security forces in Iran have treated her harshly for it: imprisonment and banning her children and herself from leaving the country. Sotoudeh who is expelled from practicing law has been doing advocacy work. Since the 2018 nationwide protests in Iran, she has been providing legal advice to women who have come to be known as Women of the Enghelab Street. These are women who protest compulsory Hijab in the streets of Iran by taking off their veils in public. 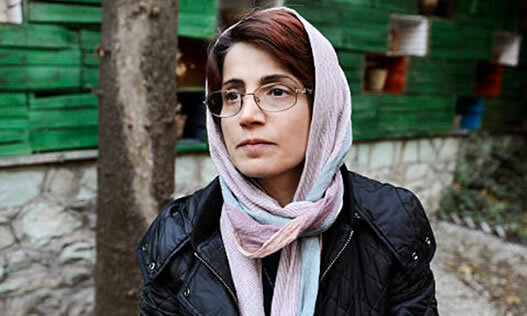 Sotoudeh was the first lawyer to announce that she will represent Vida Movahed the first Woman of Enghelab Street who went on top of an electric box and put her white veil on a stick. Most recently she objected to the judiciary’s discriminatory policy of only allowing a handful of selected lawyers to represent political prisoners. Political prisoners in Iran have a hard time finding legal representation as is and a few lawyers like Sotoudeh who do dare to help are slapped with national security charges. As a result of her most recent advocacy work, Sotoudeh was summoned to Evin prison to be interrogated. One of Iran’s most courageous lawyers; after she was released from prison, she took to the streets standing beside political prisoners’ families and those who are demanding rights. The news of her arrest has angered many Iranian human rights activists and international figures. Schaake writes that she has raised her concern about Sotoudeh’s arrest with the Iranian Ambassador to the European Union. “Nasrin Sotoudeh has won international awards but has also paid a high price for her courage…Her arrest today is the latest example of the Iranian authorities’ vindictive attempts to stop her from carrying out her important work as a lawyer,” writes Philip Luther, Research and Advocacy Director for the Middle East and North Africa at ‎Amnesty International. The Islamic Republic Judiciary has not yet made a comment about Sotoudeh’s arrest nor have they announced any charges against her. In the past five years, has already spent three years in prison, 50 days of which she was on a hunger strike.